Leading directly to Namsan Tower (N Seoul Tower), one of Seoul’s most enduring landmarks, the Namsan Cable Car is a must for travelers visiting Seoul for the first time. Cable cars run from morning to night, and their glass cabins provide 360-degree vistas of Seoul’s sprawling cityscape and the mountains of Bukhansan National Park. 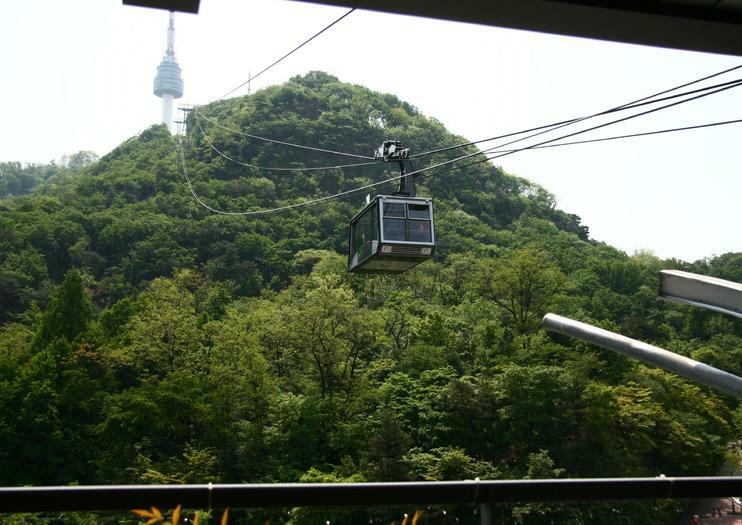 Travelers can ride the Namsan Cable Car as part of a Seoul sightseeing tour, which come in many forms. Evening tours reveal Seoul illuminated by night and typically include a round-trip ride on the Namsan Cable Car and a dinner cruise on the Han River. Daytime tours provide a comprehensive introduction to Seoul by combining the N Seoul Tower and cable car with major Seoul highlights over the course of either a few hours or a full day. Active travelers can hike to the summit of Mt. Namsan and then take the cable car back down. Be prepared to wait in line if visiting the cable car at night. If you’re not willing to walk, you can take an outdoor elevator to the cable car station. The cable car ride lasts three minutes. The Namsan Cable Car is wheelchair-accessible. To reach the Namsan Cable Car, take exit 3 out of Myeong-dong Station and follow the street to the right of the Pacific Hotel. It’s around a 20-minute walk, mainly uphill. Alternatively, take the Namsan Oreumi elevator to the cable car station to skip the walk. The Namsan Cable Car is open daily between 10am and 11pm. The lines for the cable car are at their longest during the evening, from just before sunset to around an hour after dusk, so if you want to beat the crowds it’s recommended to visit in the morning. Far from just an observation deck, the N Seoul Tower houses attractions to suit every type of traveler. The tower stands a whopping 777 feet (237 meters) and boasts three observation decks, numerous coffee shops, a Hello Kitty museum, and six restaurants, which serve everything from traditional Korean bibimbap (rice and vegetables served in a hot-stone bowl) to gourmet French cuisine. Oplev Seoul på denne hel- eller halvdagsvandring, herunder Namdaemun Market, Mt Namsan og Myeongdong Street. Følg din guide til Namdaemun Gate, udforske det traditionelle marked og få indsigt i Joseon-dynastiets historie. Så rejs med bus op Mt Namsan for panoramaudsigt, før du slentrer rundt Palgakjeong og kører svævebanen ned til Myeongdong Street. Hvis du vælger fulddagen, fortsætter du til en koreansk frokost og guidede stop ved Deoksugung Palace og Seoul Museum of History, der afsluttes med en 75-minutters optræden på Jeongdong Theatre. Privat tur i Seoul. Muslimsk venlig. Den unikke del om denne tur er, at rejsende kan bruge mindre på at rejse, da dette er en budget rejse, men rejsende kan stadig opleve mange ting, mens de stadig er i Seoul!